Most of the e-commerce websites provide nice UI for filter product on their website by using different type of search filter like price range product filter and checkbox search filter. This type of product search filter with price range filter and checkbox product filter feature we have discuss here by using Ajax with PHP. In this post we will describe you how to search a product from list of product by using Ajax JQuery PHP and Mysql. Here we have developed product filter which are similar to largest e-commerce website. They have use this type of search filter for filter product on their website, so user can easily filter product on different category search filter. If user has select any price range then in this feature it will filter product which has been covered between that price range and same way if user want to find particular brand product which has come between that price range then user can also select brand then it will live display all product which relate to particular brand. This tutorial is based on live filter of product using Ajax which has been used most of the ecommerce website. If you have visit any ecommerce website for buying product then you have first prefer price and in that price we want to get particular brand then you have to find particular product then you can easily filter from list of product on web page without refresh of web page. Here we have get result by using Ajax Jquery with PHP and Mysql. For make this type of functionality for our web application we have use Jquery UI slider plugin for filter product on price and HTML Checkbox input field for filter product on different category like brand etc. If user select particular condition and that condition will match with data available in database then that product will be display using PHP with Ajax. And if user clear filter then it will seen all product on web page. 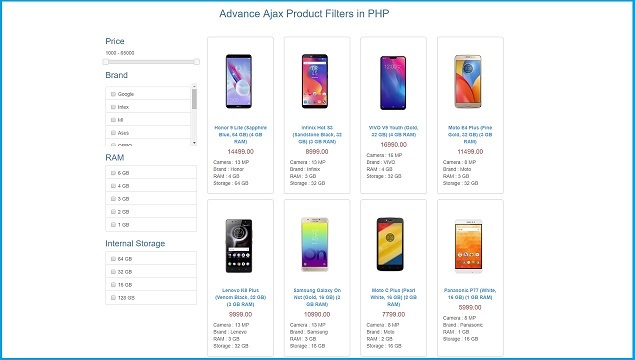 Below you can find complete source code of Ajax PHP Product filter. how to use Pagination in this ? It does not have database. Where is the sql file? Je suis vraiment content, parceque j'ai beaucoup appris à votre côté. Merci proffeseur . s'il vous plaît, vous pouvez créer le droit d'accessoires aux pages ? Vraiment ça sera très super. Merci . but am having some issues. it seems the js disables some other js codes in my php script.